Are Computers Exploiting MLP Investors? Energy infrastructure roared higher during the first six trading days of January. After four days, the sector had recovered December’s losses. Two days later, it had almost recouped all of 2018's. It was a complete reversal of last month, when slumping equity markets dragged pipeline stocks lower. It’s looking increasingly likely to us that automated trading strategies relying on complex algorithms (“algos”) are at least part of the reason. Last year MLPs had already been laboring under the weight of serial distribution cuts. For example, AMLP’s payout is down by 34% since 2014. Incidentally, this must be the worst performing passive ETF in history. Since inception in 2010, it has returned 4% compared to its index of 25%. Its tax-impaired structure is part of the reason (see Uncle Sam Helps You Short AMLP). 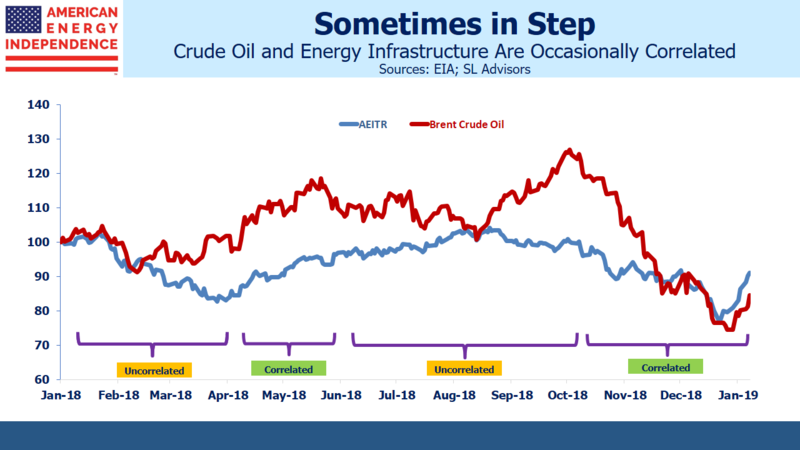 For the first nine months of last year, crude oil and energy infrastructure moved independently of one another. Investors who painfully recall the 2014-16 energy sector collapse complained that rising crude prices didn’t help, but as the chart shows, they rallied together in the Spring but parted company in late Summer as the oil market started to anticipate the re-imposition of sanctions on Iran. Crude and pipeline stocks are intermittently correlated, because their economic relationship is weak. Crude sometimes drives sentiment, which can quickly change. However, when crude dropped sharply following the Administration’s waivers allowing most Iranian exports to continue, energy infrastructure followed. Pipeline company management teams routinely show very limited cash flow sensitivity to commodity prices, and 3Q18 earnings reported in October/November were largely at or ahead of expectations. Nonetheless, an algorithm incorporating the 2014-16 history would expect MLPs to follow crude when it drops sharply, and would act accordingly. Trading systems bet on falling MLPs following crude, and sold. Disclosure: We are short AMLP.